My name is Rachael and I'm the proud owner of a super cute, 2.5-year-old female leopard gecko named Luna. She lives in a 10-gallon tank with a reptile carpet, a cool hide and a warm hide, two overhead lights (one night and one day), and an under tank heat pad beneath her warm hide. She's terrible, and I mean terrible, at hunting crickets, so I only feed her mealworms dusted with calcium. She's been happy and healthy for the whole time I've had her. Last night, I discovered a whitish yellowish crud in one of her nostrils and poking out of her mouth. When I checked back an hour later, the crud in her nose was gone and both nostrils were clear, but the crud was still poking out of her mouth. I used tweezers to gently pull it out (this did not seem to bother her at all) and it came out easily. I've attached a picture of the crud I pulled out. Could this be mouth rot? She seems like her usual self besides this and I haven't seen any new crud this morning. Are there any irregularities where her top lip meets her bottom lip? Please look inside her mouth. Does it look all pink and "healthy"? 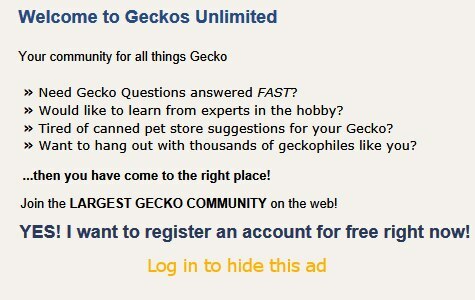 This link shows how to get a gecko to open it's mouth. I used the method outlined in that video and she seems to be a bit stubborn about opening her mouth, but the little glimpses she gave me show a pink and healthy mouth. There are no irregularities between her top and bottom lips. That's not unusual. Geckos in general "keep their mouths tightly closed" especially when it's time for vet checks or for meds! It does not sound like your leo has mouth rot. Okay great, thank you so much!! What do you think that stuff I pulled out of her mouth was then? I really don't know what it was. If it does not happen again I would not worry. Do you think it could be part of her last mealworm?